Located adjacent to Walt Disney World® Resort, this luxury Orlando resort features 5 outdoor pools, 3 restaurants, and a lazy river. Guests can relax in one of the 8 hot tubs and also have access to 3 game rooms, miniature golf course, and fitness centre. This beautiful resort features one- and two-bedroom family-style suites with all the amenities of home. 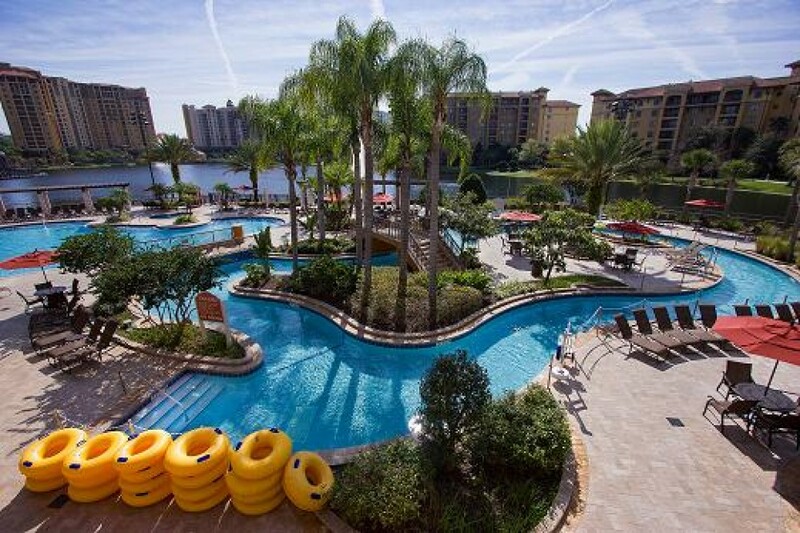 The European-inspired retreat features 2 lazy rivers, 5 pools, mini golf, and is next to the Waldorf Astoria Golf Club and near the four Disney golf courses. A transfer service to Disney World is also available. Inside the 2-bedroom villas, relax within a home-away-from-home feel with a fully- equipped kitchen, private balcony, and washer/dryer. It’s a perfect accommodation for families, with separate bedrooms, free WiFi, TVs with DVD players, and separate living areas with pull- out sofas. Some have whirlpool tubs and views of Disney World’s nightly fireworks. Dining options include La Cantina Grille, which serves American cuisine for lunch and dinner. La Cocina Pizzeria and Bar specializes in American and Italian-inspired fare. Outdoor dining with a pool view can be found at Escudos Bar and Grille. The whales, dolphins, and penguins of SeaWorld Orlando are within a short drive away. The Wizarding World of Harry Potter at the Universal Orlando Resort is also within short proximity of the resort. Grownups can enjoy Orlando Premium Outlets for upscale shopping at outlet prices.